Each of us most likely has at least one memory of nasty sunburn. Whether experienced personally, or by a close family member or friend, the symptoms are likely to include anything from red hot skin – either tender or painful to touch, to nausea, dehydration, blistering and flaking or peeling of the skin. 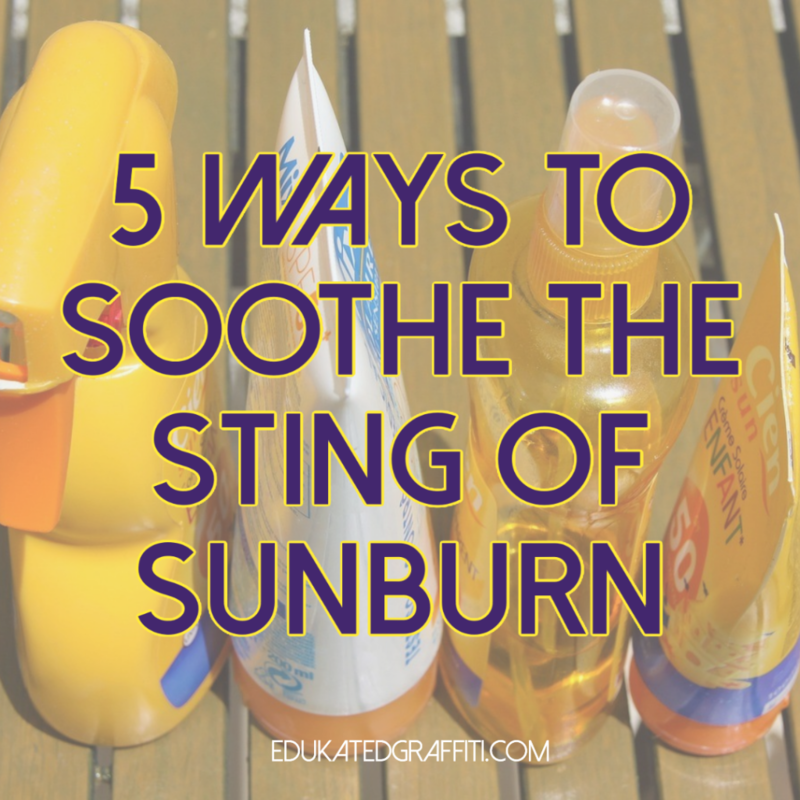 As anyone who has experienced bad sunburn will verify, the amount of time spent causing the sunburn, is largely disproportionate to the length of time that can be spent suffering the consequences of its effects. In this respect, and depending on the severity of burning, — pain and discomfort can persist for several days after the event, as the body works to heal and recover from the unprotected UV exposure. a. Add 10 drops of so of essential oil (chamomile or lavender) to the bath. Soak for 15 minutes or until relief is felt. b. Adding baking soda (or oatmeal) to a lukewarm bath can also relieve sunburn pain. For this treatment to work best, try to make sure that all affected areas are submerged. Bath water can be poured over your body using your hands or a soft washcloth. Burned facial areas can be gently dabbed using the cloth, or alternately you can splash water directly onto your face. After soaking, lightly pat the skin dry with a soft towel (preferably cotton). If you’ve take an oatmeal bath, let the light coating of oatmeal that clings to your skin remain. c. Adding vinegar to the bath water will help in taking the sting out of sunburn. Rubbing alcohol: – Because it evaporates so quickly, dabbing on rubbing alcohol will quickly cool and ease the pain of sunburned skin. Vinegar: – Vinegar is an effective and cooling treatment for sunburn. Soak towels with it, and apply to the burned areas. Alternately you can fill a spray bottle and spray it directly on the skin as needed. Egg Whites: – If your burn is painfully hot, separating the white from the yolk of an egg, and then spreading the white over the affected area will help to cool the burning instantly. This can be repeated as often as needed. Potatoes: – Potatoes can also be used to relieve the pain of sunburn. Take 2 potatoes and wash them well. Cut them into tiny chunks and place in a blender to liquefy. (If the result appears too dry, add some water). Pat the affected areas with potato juice. Wait until dry, and then rinse off in a cool shower or bath. Remember that as well as causing varying degrees of discomfort and pain, repeated sun exposure and sunburn also accelerates the aging process and can increase the risk of cataracts and skin cancer. Prevention therefore should also always be considered more preferable than treatment!